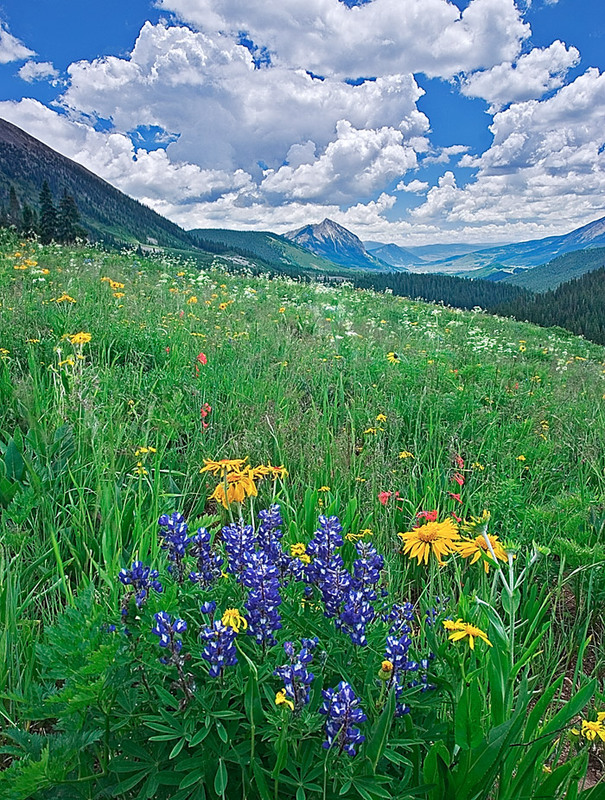 Crested Butte is located in Southwest Colorado and calls itself the Wildflower Capitol of Colorado where the annual Crested Butte Wildflower Festival is a weeklong event held every July. If you travel just a short distance in almost any direction you will find yourself in vast, colorful fields of mountain wildflowers. The uniquely shaped Mount Crested Butte in the background is a ski resort with a summit elevation of over 12,100 feet. In order to get the wildflowers in the foreground and the mountains in the background in sharp focus, I needed my depth of field to be from about 2 feet to infinity. With the late afternoon and overcast light causing my shutter speed to be longer than 1/2 second, I was fortunate that there was no wind to blur the flowers. I like to photograph wildflowers on partly cloudy or overcast days, because the diffused light reveals fine detail and saturates the color. Photo © copyright by Mike Barton.